If you love salmon and teriyaki as much as I do, you’re going to love this teriyaki salmon bowl! I love everything about this recipe! It’s made with juicy and flavorful salmon, home-made teriyaki sauce and loads of veggies. Dinner can’t get any easier, or more delicious, than this! Salmon is my favorite seafood, with lobster and scallops being close seconds. I love the versatility of this fish and I love that it’s readily available in my local grocery store year round. I first saw this idea of a salmon bowl on Pinterest and thought, why not make my own? I like to remove the skin from my salmon, but feel free to leave it on if you like it. Slice the fillet into serving size portions for easier and faster cooking. I love making my own teriyaki sauce; I never buy the store varieties any more since it’s so easy to make! Then load up your bowl with white or brown rice, or even quinoa. Add your favorite veggies on top; I like to use avocado, bell peppers, carrots, edamame beans and radishes. Feel free to add any of your favorite veggies! 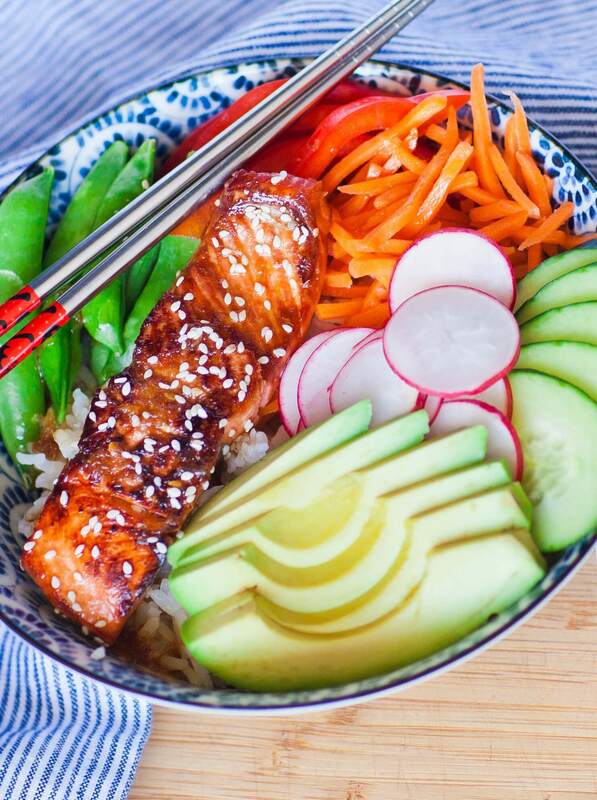 This teriyaki salmon bowl is also great to make ahead of time and pack yourself a lunch for the next day! Just pack the bowl into a glass container and you’re all set to go! Prepare the salmon marinade first. Combine all marinade ingredients in a measuring cup: soy sauce, sesame seed oil, mirin, water, brown sugar and garlic. I used a zester to grate the garlic into a puree. Stir and set aside. Using a sharp knife, remove the skin from the salmon and any bones with kitchen tweezers. If desired, leave the skin intact. Portion the salmon into serving-size pieces and place into a large bowl. Pour the prepared marinade over the top. Place the salmon into the refrigerator for 30 minutes. Meanwhile, prepare the veggies and rice for the bowl. I used white rice but brown rice will also work; just use your favorite brand. Slice the vegetables into thin strips and slices. Slice the avocado last, right before serving, so it doesn't discolor. Preheat oven to 375F. Heat a large frying pan over medium heat with a tablespoon of olive oil. Once the pan is hot, remove the salmon from the marinade and add to the pan. Sear the salmon for a few minutes, then carefully turn over. Transfer the pan into preheated oven to finish cooking, about 7 to 9 minutes, depending on the thickness of the fillet. This was so tasty! I added some grated ginger as well, it was sooo tasty and easy, I cannot wait to make it again! Thanks so much for the recipe! I love adding ginger, too! 🙂 So glad you enjoyed it!